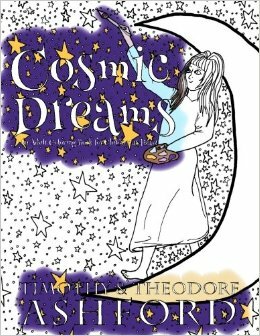 Cosmic Dreams: Adult Colouring Book by Timothy and Theodore Ashford is a colouring book with a difference. I love the way it begins with a story to give the reader / artist permission to enjoy being creative. Creativity and using one's imagination is very important for health and well being and to improve important life skills such as problem solving. It's a wonderful stress release. I love the fact that the drawings include stars and the luminaries as a means to waken the imagination. The author / artist has given some ideas for those using the drawings to colour in the images provided. The images actually lend themselves to being creative on several levels. It would be rather fun to sprinkle glitter or coloured sand where the stars are, probably after colouring the sky in whatever colour you choose. Use stickers or other crafty items to enhance the picture. As an Occupational Therapist, I could very much envisage a fun creative group with teenagers or young adults combining drawing / colouring with creative writing, discussion and possibly some mime or drama. What a wonderful way to increase creativity in one's life, or as a warm up for a personal development group. Some of the images are a little busy, but the fun of this colouring book is that you can choose which images to colour or not to. Some images are wonderful just as they are, and still tell the story of this interesting book.